1. Don’t! Ignore that cough. Cancel that meeting. Show up to class with a box of Kleenex and a bottle of DayQuil. 2. Don’t. Let the sub fend for him- or herself. 3. Don’t. Put a kid in charge instead. Your students can tell the sub where to find all the “worksheets,” the tempera paints, the science chemicals…. 4. Stay up late. Use the night before to get all those sub notes written out. Why not? You’re gonna sleep all day tomorrow, right? 5. Go in early. You’ll probably already be up vomiting at 4 a.m. anyway. 6. Give ‘e more screen time. Leave a collection of Disney movies and Bill Nye videos on your desk. 7. Copy. Leave the same sub plans your neighboring teacher used last week and hope the sub can adjust. 8. Hope for a snow day. 9. Or, download EZSubPlans. It’s the easiest and most professional way to prepare for a sub. 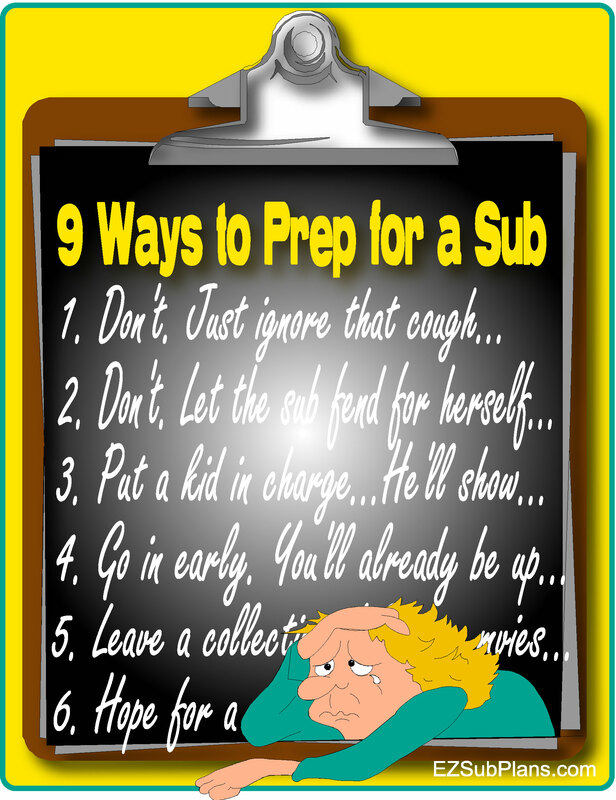 We all know preparing for a sub is tedious and time consuming, but it doesn’t have to be. Just click, print, and relax! Rather than staying up late, showing up sick, or throwing your sub under the bus, give our emergency lesson plans a try. Because they provide your students with quality, standards-based lessons that don’t interfere with your regular instruction, EZSubPlans represent good practice. And they’re just a click away. Download your EZSubPlans today so you’re prepared tomorrow! Whether a classroom teacher, substitute, or administrator, EZSubPlans will provide you with inexpensive, kid-tested plans at the touch of a button. Each EZSubPlans package includes at least seven hours of grade-specific lessons designed to make your next absence easy and worry-free. Classroom teachers wanting to avoid the frustrating and time-consuming process of preparing for an absence and substitute teachers needing back-up material will find everything they need with EZSubPlans. Days are labeled by grade level, but each can be easily adapted to suit one grade level up or down. A fifth grade teacher, for example, could use the lesson plans for grades 4, 5, and 6–that’s six days in all. Each set includes a reading text and comprehension exercise, a spiraling math activity with extensions, a grammar lesson, an art project, a writing task, and even opening and closing activities.Teachers need only to download and print–the sub does everything else. Click here for more information about EZSubPlans or click here to preview or purchase at TeachersPayTeachers. How much is a stress-free sub day worth? Who can say? How much does a stress-free sub day cost? Just $5 a day with EZSubPlans. Technology has it benefits, but sometimes I wish I could go back to teaching the way it was when there were blackboards, 35 mm film projectors, and life-threatening playground structures. Ah, simpler times! Wasn’t all this new-fangled technology supposed to make things simpler? You’re probably thinking that in many ways it has and in other ways it’s made thing massively over-complicated. Whatever the case, it reminds me that all the products I post on TpT, I’ve created out of a need for materials that are a.) kid-centric (I want my students to love being in my class); b.) easy-to-use (I don’t want to wade through a massive teacher’s edition to figure out how to do something); and c.) sustainable (I want regular routines that won’t keep me up at night). Simple. With all that in mind, here are a few items I think you’ll want for Back-to-School. Fact Car Rally Race. Mastery of the math facts is the foundation of all things math, so a program that keeps kids focused on truly memorizing their tables is essential. In Fact Car Rally, students create their race cars during the first week of school and spend the year progressing around the race route as they pass fact quizzes—addition and subtraction for youngers, multiplication and division for olders. “Way better than Rocket Math,” say kids and teachers alike! Super Sentences & Perfect Paragraphs. No need for expensive textbooks, software licenses, or complicated teacher editions! Everything you need for an entire year’s writing program is right here in one, easy-to-use and engaging package. Try out a free sample by clicking here, and if you like it, snag Volume 1 from Scholastic Teaching Resources (it’s cheap), or my new Vol. 2, which will be available on TpT soon. EZSubPlans. Be prepared for that emergency absence by prepping your plans now, before you’re desperate. It’s easy with EZSubPlans—just click, print, and relax! There are sets for 3rd, 4th, 5th, and 6th grades, but they’re largely interchangeable. In fact, I use all four sets at fifth grade, meaning I’m already covered for up to eight emergency absences. Eight! Why Use Drama? My free reader’s theater primer outlines ways to make Read Aloud Plays work for you. Take a look, and then download a couple especially fun plays to break the back-to-school ice such as Peter Rabbit, Two Plays from The American Revolution, and Ponce de Leon and the Fountain of Youth. Have a great school year and—Happy Directing! 3. Put a kid in charge. Your students can tell the sub where to find all the “worksheets,” the tempera paints, the science chemicals. 4. Stay up late the night before to get all those sub notes written out. Why not? You’re gonna sleep all day tomorrow, right? 6. Leave a collection of Disney movies and Bill Nye videos on your desk. 7. Leave the same sub plans your neighboring teacher used last week and hope the sub can adjust. Whether a classroom teacher, substitute, or administrator, EZSubPlans will provide you with inexpensive, kid-tested plans at the touch of a button. Each EZSubPlans package includes at least seven hours of grade-specific lessons designed to make your next absence easy and worry-free. Classroom teachers wanting to avoid the frustrating and time-consuming process of preparing for an absence and substitute teachers needing back-up material will find everything they need with EZSubPlans. And what better time to prepare than before the school year begins! Days are labeled by grade level, but each can be easily adapted to suit one grade level up or down. A fifth grade teacher, for example, could use the lesson plans for grades 4, 5, and 6–that’s six days in all. Teachers need only to download, print, and photocopy–the sub does everything else. Imagine, your first six absences of the school year already prepared. On each of those mornings, you merely set the EZSubPlans file on your desk and walk away! Click here for more information about EZSubPlans or click here to preview or purchase at TeachersPayTeachers. How much is a stress-free sub day worth? Who can say? How much does a stress-free sub day cost? Just $5 a day with EZSubPlans. Don’t wait for that first cough, download your EZSubsPlans now and have them ready to go come the first day of school! How Much is a Stress-Free Sub Day Worth? Imagine, your first six absences of the school year already prepared. On each of those mornings, you merely set the EZSubPlans file on your desk and walk away! Click here for more information about EZSubPlans or click here to preview or purchase at TeachersPayTeachers. How much is a stress-free sub day worth? Who can say. How much does a stress-free sub day cost? Just $5 a day with EZSubPlans.